Chia seeds, the edible seeds of Salvia hispanica, a desert plant that’s native to southwestern USA and Mexico, are popular superfoods because they can boost energy, strength and stamina. As a concentrated source of carbohydrates, vitamins and minerals, chia seeds help provide energy as well as fight inflammation to promote better health and active lifestyles. Chia seeds might well be among the healthiest foods on earth. Packed with vital ingredients and nutrients with beneficial effects on health, they well deserve to be called superfoods. And this wonderful superfood has several benefits for your body and mind. Right from when the Aztecs and Mayans discovered the nutritive boost from chia seeds, they have been consumed by health-conscious eaters around the world. Though tiny, the black seeds deliver a power-packed nutrient boost. Just a serving of an ounce has 11 grams of fiber, 4 grams of protein, 5 grams of omega 3 fatty acids, and a healthy dose of minerals like calcium, manganese, magnesium and phosphorus, in addition to trace elements like zinc and potassium, and vitamins B1, B2 and B3. You might imagine this comes at a high calorie cost. But no. 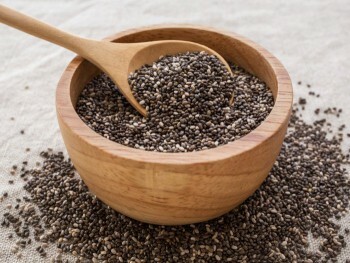 A serving of one ounce of chia seeds has only 135 calories! Chia seeds are usually grown organically without GMO, and is gluten-free. 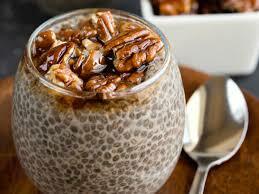 Anti-oxidants in chia seeds help keep the fats in it from getting spoiled. When we eat the seeds, the same antioxidants deliver some beneficial health effects, such as preventing formation of oxygen free radicals that are injurious to cell walls and internal structures. This conveys anti-aging and cancer prevention benefits. We’ve already discussed the fact that chia seeds are carbohydrate rich, with each ounce having 12 grams of carbs. Interestingly, 11 grams of these carbs are in the form of fiber that isn’t digested by your body. This means the blood glucose elevation seen with other high carb foods doesn’t happen when you eat chia seeds. Also, the fiber content means chia seeds in water swell to attain a gel-like consistency. This makes you feel full and satiated, lowers hunger pangs and prevents over-eating. The rich fiber content in chia seeds also sustains bacterial flora in your gut. Recent research has proven the important role played by your gut bacteriome, and chia seeds with 40% fiber content is great at preserving it. Measured by percentage of weight, a staggering 14% of chia seed is protein. But even more vital is that they are in the form of essential amino acids. As dietary nutrients, proteins confer several of the benefits of chia seeds. It aids weight loss and muscle building as well as in the repair of damaged organelles inside each cell. High protein intake lowers appetite and keeps food cravings away. Chia seeds are an excellent source of plant protein, a factor of importance to those who cannot or will not eat animal products. Experts agree that chia seeds can help you lose weight. Given the capacity to absorb water and swell in your stomach, thereby giving the sensation of satiety and lowering hunger pangs, chia seeds can ensure against over-eating. As the calorie content is low and carbs are in the form of indigestible fiber, snacking on chia seeds can help reduce the intake of other foods which pile up on your body as fat stores. Eating chia seeds for breakfast is helpful in reducing weight. But as a standalone weight lowering dietary device, chia seeds have been disappointing with a few trials showing no significant weight loss among those eating chia seeds, although there was a lowering of fatty acid levels in the blood. Obese people who switched to eating chia seeds did reveal an encouraging drop in weight in the short run. It must be viewed as an adjunct to other weight lowering measures than a standalone treatment for obesity itself. Chia and flax seeds are fantastic sources of dietary omega 3 fatty acids, even better than salmon and other better-known foods. Omega 3s are essential fatty acids that cannot be manufactured by your body, and therefore must be provided only through dietary sources. There are 3 kinds – DHA or docosa hexaenoic acid, EPA or eicosa pentanoic acid, and ALA or alpha linolenic acid. Omega 3 fatty acids are important for their anti-inflammatory activities which help bring down blood cholesterol and triglycerides, providing protection against heart disease, depression, arthritis, Alzheimer’s disease and other neurological problems. Hemp and walnuts are other dietary sources of essential fatty acids. The relative proportion of the 3 types is responsible for their effectiveness in promoting health and relieving suffering. As they are fiber rich and contain heart-protective omega-3 fatty acids, chia seeds are widely acknowledged as bringing down the risk of heart disease. However, stringent research studies remain inconclusive in their recommendations. 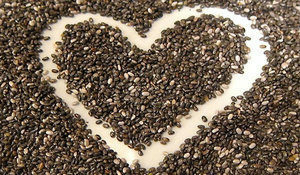 While chia seeds can bring down risk factors like inflammatory reactions, insulin resistance and visceral fat deposits, there isn’t yet enough convincing scientific evidence that chia seeds safeguard against heart disease. There are limited chia seed benefits in lowering blood pressure, but in general, the intake of chia seeds must be combined with other lifestyle changes to enhance heart health. Calcium, phosphorus, magnesium and protein are densely packed into chia seeds. Interestingly, these ingredients also go into the make up of healthy bones! An ounce of chia seeds delivers a fifth of an adult’s daily requirement of calcium, making it a source of the mineral that’s richer than even dairy products. So chia seeds are an excellent alternative to vegans and those with dietary preferences that avoid any form of dairy. It’s easy to include chia seeds in your diet. The seeds are tasteless, which means you can add them to practically anything. Salads or soups, bread or rice, pastries or curries. 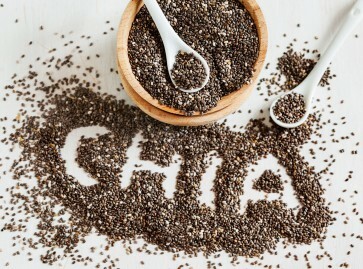 Since chia seeds are easily digested, you don’t have to pound or grind them like flax seeds, making it easy to prepare. Chia seeds can be eaten raw, soaked in water and added to chia seed pudding, porridge or juice, included in smoothies, or baked with muffins, biscuits or cakes. They help thicken sauces and can substitute for eggs in some dishes. Where to buy chia seeds? Like goji berries, they are readily available in supermarkets and health stores. Online retailers make it convenient to order these superfoods right from the comfort of your home. Adding 20 grams of chia seeds twice daily to your diet can be a right step in improving your health. This entry was posted in Health & Wellness and tagged chia seeds, chia seeds superfood, superfood on July 11, 2018 by Healthy Living Guide.